Artesia High School head football coach Cooper Henderson has always been quick to deflect attention from himself. Words like “dynasty” and “legacy” don’t sit well with him, and if you ask for his personal records, his honest answer is that he doesn’t know them. He just doesn’t keep up with that sort of thing. Henderson doesn’t deal in wins and losses, or even the number of blue trophies in the heavily laden case at Bulldog Bowl. His is ultimately a labor of love – of the game, the community of Artesia, his fellow coaches, and, above all, the young men whose lives he impacts. Along the way, he has compiled a set of statistics any coach would envy. An overall record of 293-103-1. 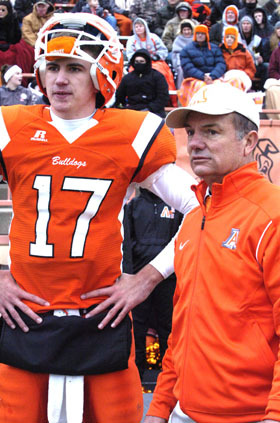 Sixteen state championship appearances since taking the helm at Artesia High in 1989 – 14 of which resulted in titles. Another word Henderson doesn’t put much stock in is “legendary,” but that’s what he’s become in the annals of New Mexico high school football. And as a reflection, he was named Wednesday afternoon as the National Federation of State High School Associations’ National Coach of the Year for 2015. One adjective the coach might not mind is “respected.” Henderson inspires a deep sense of admiration not only from the coaches he works with daily but those throughout the state. They cite him frequently as the type of coach they aspire to be, not only for the tradition of success he has been able to build with the Artesia program but for the quality boys that comprise it – boys that move on to become quality men. Bulldog football players past and present credit Henderson for helping to shape their lives both on and off the field. For teaching them discipline, work ethics, accountability and integrity – along with likely the best understanding of football of any players in the state. Henderson stresses that’s a job he couldn’t do alone. “All the assistant coaches do just as much in guiding and working with this team as anyone,” he said. “When you look at all the support you get here, whether it’s the administration or the Quarterback Club, the media or the community itself – when you receive an honor like this, you definitely give a lot of credit to all those people. Henderson was nominated for the award by Buster Mabrey and the New Mexico High School Coaches’ Association and expressed gratitude to the association for the honor and their work on behalf of New Mexico high school athletes. And, of course, Henderson’s attention ultimately settles upon those he’s dedicated an impressive career to: the players themselves.